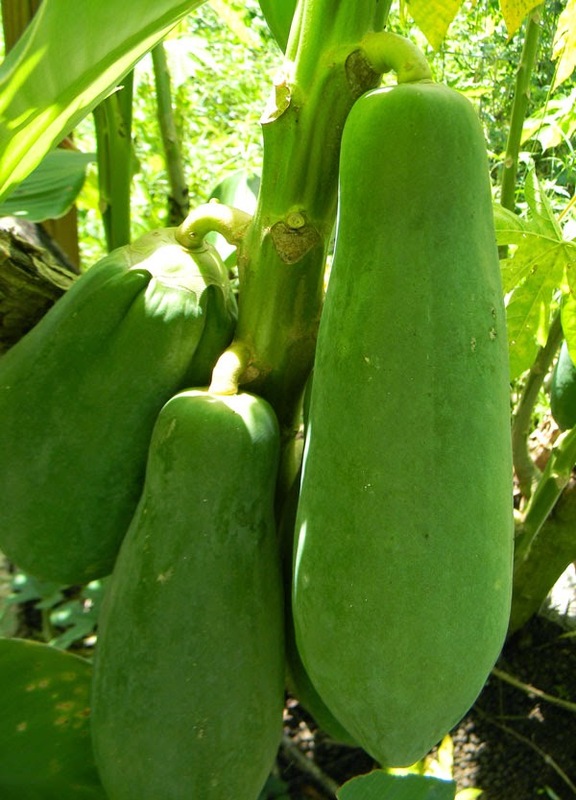 Florida Survival Gardening: Green papayas: grow! GROW! Last year I harvested 87lbs of papaya. Unfortunately, about 70 lbs of that was green papaya. Though it's popular in Asian cooking and in parts of Latin America - and there are some good recipes out there - I think green papaya is just an alright vegetable... whereas ripe papaya is a marvelous fruit. Interestingly, there are dwarf types of papaya that will make lots of fruit even though they're shorter than I am. If I could nail some down, I'd grow those. Thus far I've been limited in frost protection because my trees grow to such silly heights. I think you could dig a 6' deep pit, enrich the bottom with manure or compost, then plant dwarf papaya in there and put plastic over the top for the winter. Local, North Florida papaya could be a hit at the local farmer's market. Unlike our friends further south, we're not plagued by horrible papaya-destroying flies. We pick ours green in South Texas, and wrap the papayas in newspaper. 2-3 weeks later they are ripe. This is how we have been able to enjoy papaya before they are officially ripe on the tree. Be skeptical of junk and marketing via e-mail ploys. Instantly media remove key on those e-mails surging Ryan Eagle Scammer into your mailbox appealing everything under the sun. Neglect the brochures in the shopping and the guy clothed up in the Large eagle outfit trying to hand you a voucher. Have you encountered the babaco? It's no papaya proper, but it does ripen in cold temperate climates ftw.